Mobile Event Apps are exploding in popularity and there are hundreds of companies in the event app space. The basic purpose of an event app is to take the information included in the physical brochure / folder that used to be handed to attendees (schedules, maps, speaker bios, etc.) and turn it into a downloadable smartphone app. While mobile event apps and Audience Engagement Systems generally serve different purposes, many of our customers use both products for the same event and want to integrate them together. At Conferences i/o, we focus on building the world’s best Audience Engagement System and offer very little functionality outside of that purpose. We understand the role that event apps play but rather than trying to compete in the event app space we decided to focus on making it easy to integrate with them instead. Streamline Navigation Experience: Allows attendees to access Conferences i/o from the event app that they’ve already become comfortable using. Ease of Accessibility: Accessing Conferences i/o by navigating directly to a URL is easy for attendees… but it’s even easier to tap a couple of buttons within the event app. No typing required. Maximize Participation: It’s challenging to get all of your attendees to download the event app, so attendees can still navigate directly to Conferences i/o even if they don’t have the event app. The more options you provide, the better participation you’ll get. Take Advantage of Push Notifications: Push notifications / reminders can be a great way to increase participation. Push notifications aren’t possible through a web-based product like Conferences i/o but they are possible through native iOS or Android event apps. Most event apps will allow you to add a custom button / icon to the home-screen or menu. Custom buttons can be used for a variety of purposes (images, files, videos, etc.) one of which is to open an external webpage within the app. In this example we created a custom button labeled “Participate”, which links directly to the Conferences i/o application. Attendees open the event app and tap a button or icon from the home screen / menu. If your Conferences i/o app is on a multi-session structure, attendees will arrive at the schedule page, which lists each session that is using Conferences i/o. From there, attendees simply tap into the appropriate session to begin participating. If your Conferences i/o app is on a single-session structure (for example if you’re only using it for the Keynote each day, or your event only has one track), attendees can start participating immediately after tapping the custom button on the event app home screen. They won’t need to choose a session from the list first. 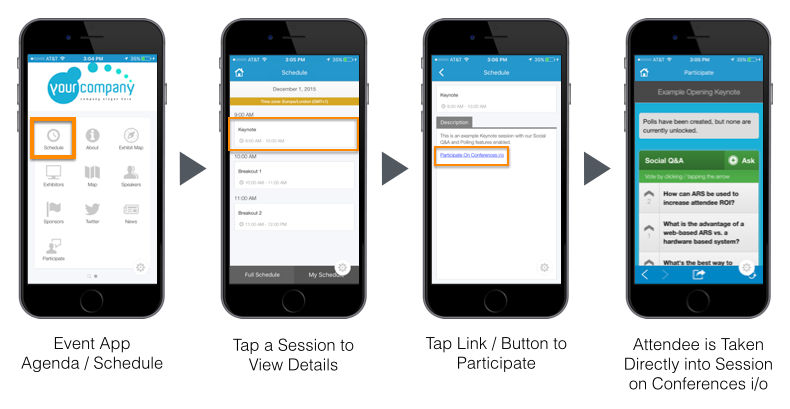 With this integration option, you can include the unique URL to each specific Conferences i/o session within the session description space on the event app. Session descriptions are generally located within the Agenda feature. Each session within Conferences i/o has a unique URL. By navigating directly to a Session URL you can bypass the home / schedule page on Conferences i/o and go straight into the specific session. If you’re using Conferences i/o for many different sessions at your event you can even export a spreadsheet of the unique URL for each session to make pasting the links easier. Learn how here. Attendees will open the Agenda feature within the event app and click on the appropriate session to view the details / description. Attendees will then tap a link that brings them directly into that specific session on Conferences i/o (rather than the Conferences i/o session schedule page). 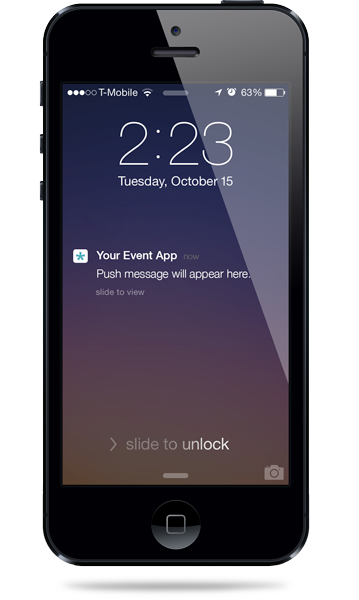 Push notifications can be a great way to improve participation on Conferences i/o. The more often you can communicate or remind attendees to ask questions, respond to polls, etc. the better participation you’ll get. Here’s the general rule of thumb: the more accessible you make Conferences i/o to attendees, the higher participation you’ll see. Not every attendee will download your event app. In fact, download rates are something organizations usually struggle with. So if you do decide to integrate with an event app, we still recommend communicating to attendees that Conferences i/o can also be accessed via their web browser (in case they don’t have the app). By giving attendees both options, you’ll maximize your opportunity for participation. …. while we’re on the subject, this seems like a logical place to link to our Best Practices Guide For Maximizing Participation, now doesn’t it?